Others, in addition to the late Ron Wyatt, advocate the Red Sea Crossing at the Gulf of Aqaba/Eilat. Those who take this view also place Mount Sinai in Saudi Arabia. If you have not taken a look at Life and Land by Gordon Franz, I suggest you do so. Gordon is a careful scholar. His material is always well researched and documented. One category that caught my attention at Life and Land is called Cracked Pot Archaeology. Here is how he describes this category. The Cracked Pot Archaeology category contains articles about popular, contemporary archaeological theories and ideas that, like cracked pots, hold no water! These articles are a review, scholarly analysis and critiques of theories and ideas that have been presented on the Internet or popular books, movies, DVD’s and videos. Over the past few years Gordon has written a number of articles about the claims of the late Ron Wyatt and Robert Cornuke. Cornuke claims to have found an anchor from Paul’s shipwreck on Malta. He also claims to have photographed an inscription with the name Yahweh (LORD/Jehovah) on it. The inscription was found near Jebel al-Lawz, in Saudi Arabia, which, according to Cornuke, Wyatt, and several others, is the real Mount Sinai. The assertion that Mount Sinai is at Jebel al-Lawz in Saudi Arabia still lacks credible and verifiable historical, geographical, archaeological, or biblical evidence. You will find links to three articles dealing with the claim that Jebel al-Lawz in Saudi Arabia is Mount Sinai. Another, more technical article by Franz, is entitled “Mount Sinai is not Jebel al-Lawz in Saudi Arabia.” It is available at the ABR web site here. will conclusively demonstrated that there is no credible historical, geographical, archaeological or Biblical evidence to support the thesis that Mt. Sinai is at Jebel al-Lawz in Saudi Arabia. Later on, over a period of weeks (months? ), as time permits, I hope to deal with specific questions about the biblical places mentioned in the account of the exodus. The terrain in the Sinai peninsula is varied. The photo below shows one scene. This photo was made January 25, 2011, the day the Revolution began in Egypt. 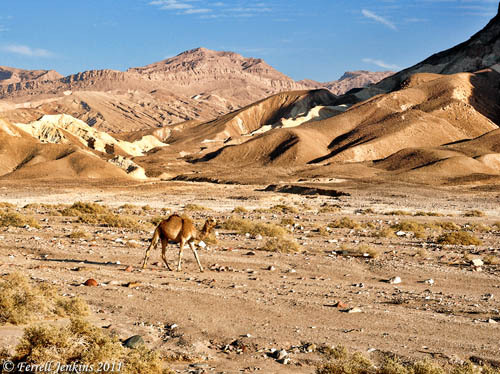 A scene in the Sinai Peninsula. Photo by Ferrell Jenkins. This entry was posted in Archaeology, Bible Places, Egypt, Old Testament, Travel. Bookmark the permalink.